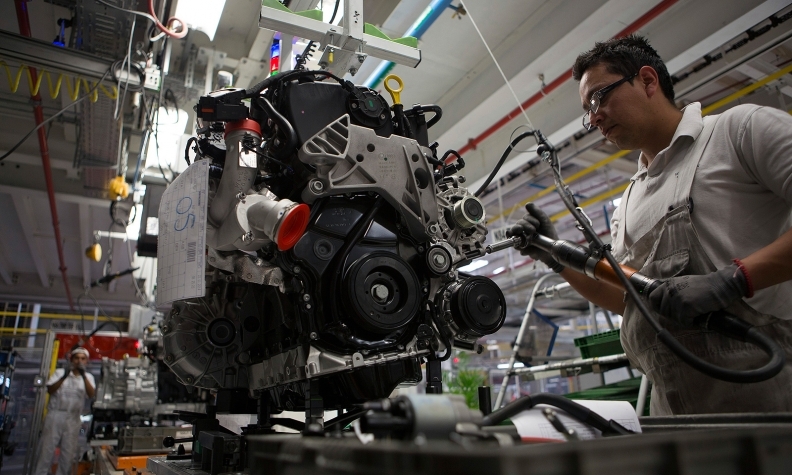 The engine line at VW's plant in Puebla. About 20 percent of the plant's 207,000 vehicles sent to the U.S. in 2014 included the engines at the core of the scandal. MEXICO CITY (Bloomberg) -- As Germany warns of a disaster for domestic employees of Volkswagen AG, fallout from the company’s emissions-cheating scandal threatens to reach Mexico operations -- its largest producer of cars for the U.S.
VW has already cut Saturday shifts at its Puebla factory, the largest stand-alone plant making VW brand cars outside of Wolfsburg, where the company is based. That has led to increased concern among the estimated 15,000 workers that jobs may go next. “Volkswagen messed with all of us,” said Alfredo Rodriguez, 29, who fears his lack of seniority at the factory makes him more vulnerable. The father of two boys 6 months old and 8 years old got a full-time contract only three years ago, and now helps install the wheels on the cars being built. “The thing that worries me most is we don’t know what’s coming." With VW refusing to provide details, business groups including the state’s employers association are concerned things will get worse at the VW factory and the plant being built by the carmaker’s Audi unit. There’s already a hiring freeze in place, according to the industrial chamber of commerce, and the company hasn’t said how it will handle a global recall of almost 11 million diesel autos with rigged emissions systems. About 20 percent of the plant’s 207,000 vehicles sent to the U.S. in 2014 included the engines at the core of the scandal. Volkswagen declined to comment about reports of a hiring freeze and said in an e-mail that it won’t comment on what it called speculation about possible repercussions at the Puebla plant. The company said in an Oct. 1 statement that there are no changes to the factory’s labor force. Audi will open the factory in the second half of next year as planned and will reach capacity of 150,000 units per year according to schedule, the brand said in an e-mailed response to questions. The auto industry has been a bright spot in Mexico’s economy over the past two years, with carmakers from Kia to Mercedes setting up factories or production lines. Volkswagen has one of the longest histories in the country, where it began building the iconic Beetle for the U.S. market in 1967 and pumped out most of the 370,000 VWs sold to American consumers last year, including the most-popular model, the Jetta. “This is going to have a snowball effect,” said Armando Soto, president of Kaso & Asociados, a Mexico City-based auto industry consulting company. "Auto exports could fall and of course the gross domestic product and performance of the economy of Puebla will be affected." Volkswagen is more than just a plant for Puebla, located 86 miles east of Mexico City. The company accounts for about a quarter of the state’s gross domestic product. A vast industrial park of providers and a robust service sector that cropped up around the plant account for about 70,000 direct and indirect jobs, according to Horacio Peredo, president of the chamber of commerce known as Canacintra. Five language schools run by a unit of the company offer classes in German, with some granting technical degrees. A restaurant-lined boulevard that serves as an entrance to the city was renamed Via Volkswagen. A Volkswagen sports club equipped with a running track serves local residents, known as Poblanos. Puebla Governor Rafael Moreno Valle, in a show of support for the embattled VW, said he’d buy 200 patrol vehicles from the automaker to help it pull through the crisis. Local resident Victor Manuel Melendez says he will still buy a diesel-engined Vento for his Uber business once Mexico concludes tests being done on thousands of diesel engines. There’s a “certain closeness, a loyalty,” said Quintana of Coparmex. On one block near the city center, five of 11 cars parked on a recent day were VWs. Outside the carmaker’s plant on the Mexico-Puebla highway, below a giant VW insignia, five taco and quesadilla stands serve up fried food to thousands of workers who come and go each day. One of those employees is Ernesto Mendez, who has worked as a technician there for 16 years. Dressed in a polo shirt beneath the blazing Puebla sun, the 57-year-old says he’s already feeling the pinch. The overtime he worked to boost his monthly salary of 10,000 pesos ($604) by 30 percent went away last week. Without extra pay, Mendez is no longer able to afford the lease on his car and is taking the bus to work. The model he had leased up until Monday: a Volkswagen Passat.